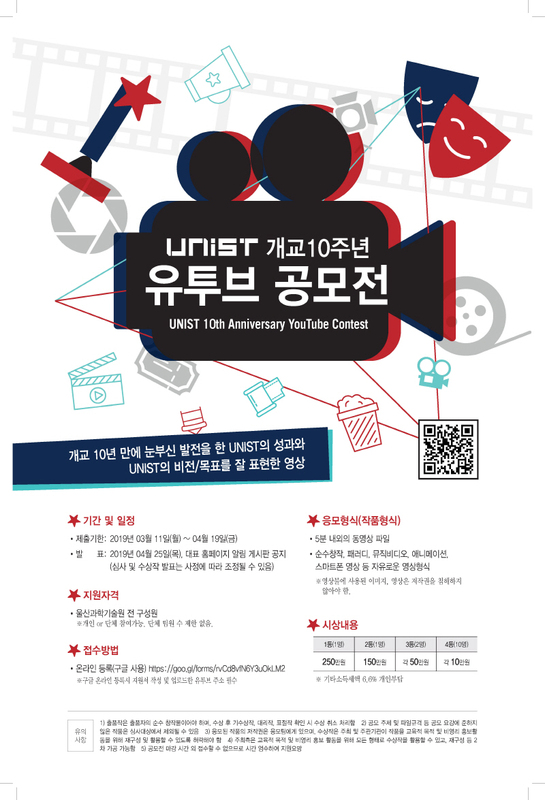 In celebration of the 10th Anniversary of UNIST, we invite all our students, faculty and staff to enlist their creativity to come up with a YouTube video which will be used in promoting our 10th birthday. Eligibility: All members of UNIST are eligible to participate. All members of UNIST are eligible to participate. ※ You can either register as an individual or as part of a team. There is no minimum or maximum number of team members required. ※ While filling in the application form, please make sure to give us a valid URL for your uploaded videos on YouTube. – From animation to music video, you can come up with whatever artistic style that is unique for your video. ※ Cite the sources of your images and video to avoid copyright infringement. 1) Only the work created by the entrant (individual/team) is accepted. Any simultaneous submission of identical work, whether an identical or different photo cut, to other contests is prohibited. Entry that violates it is subject to disqualification, before and after the winner determination. 3) The copyright of the entries belongs to UNIST. 4) Use of any entry for educational and/or other non-profit PR purposes without consent of UNIST is strictly prohibited.